Thomas Jefferson Copeland is my 3rd great grandfather. I am descended from the oldest of his four children, Henry Clay Copeland, whom I wrote about last year. As I noted at the time, much of my knowledge of the Copeland Family history is from The Copeland Family: A Copeland Genealogy by Warren Turner Copeland, published by The Tuttle Publishing Company, Rutland, Vt. (1937). This is where I find that he was born on April 26, 1801, in Boston, Massachusetts, to Nathaniel Copeland and Mary (Page) Copeland. He married Julia Elvira Townsend on October 10, 1830, in Norridgewock, Maine. 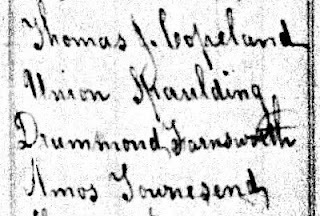 I first find Thomas J. Copeland in the 1840 U.S. Census in Norridgewock, Somerset County, Maine. Detail from 1840 US Census, Norridgewock, Somerset, Maine; Roll: 151; Page: 131. Line 18 has Thomas J. Copeland with a household of six. His household indicates that he is employed in "Manufacture and Trade." According to the Copeland genealogy, the family moved to Calais, Washington County, Maine, about 1843, where he lived for the rest of his life. Henry C. Copeland, age 18, with occupation of Clerk, but also noted as being in school within the past year. and Alice Copeland, age 2. The household also includes Jane Morrison, age 24, born in Ireland. Ten years later (1860 US Census), his household looks quite different. Thomas J. Copeland, age 59, born in Massachusetts, is listed with occupation of Lumberman. $20,000 is the value of his real estate and $25,000 is the value of personal estate. Wife Julia E. Copeland is 54 and born in Maine. Living with the couple are their daughter, Mary, age 25, and her very new husband, Benjamin F[ranklin] Kelley, age 29, and an attorney. (They were married in May and the census was taken here in July.) Two servants lived with them, Margaret Kelley, age 50, born in New Brunswick, and Hugh Fogg, age 18, also born in New Brunswick. Their son (and my 2nd great grandfather), Henry Clay Copeland, was living nearby with his wife, newborn son, and in-laws. Their daughter, Julia had died four years before. See her memorial at Find A Grave. Their son, Charles Franklin Copeland had died earlier in 1860, at the age of 22. See his memorial at Find A Grave. By 1870, the households of my ancestors who were living in Calais had changed again. Detail from 1870 US Census, Calais, Washington, Maine; Roll: M593_562; Page: 68. 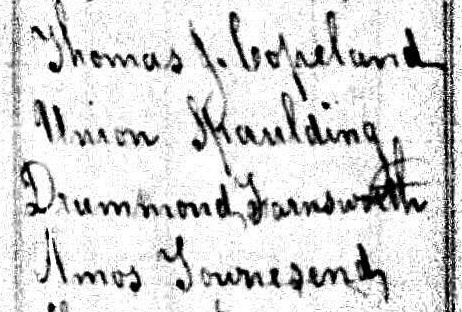 In 1870, Thomas is living with his son, Henry C. Copeland, who is misidentified in this enumeration as Chas. H. Copeland. Based on a gravestone record from Calais, Maine, his wife, Julia E. died on October 19, 1868. Also in the household is his daughter-in-law's widowed mother, Sarah (Smith) Lowell. I have always loved this census listing - my seven-year-old great grandfather (Lowell) was living with his brother, his parents, his paternal grandfather and his maternal grandmother, as well as a couple of servants. My third great-grandfather, Thomas Jefferson Copeland, died on March 2, 1877, in Calais, Maine, and is buried with his wife in Calais Cemetery. See his Find A Grave memorial here, which includes a transcription of his obituary from the Calais Advertiser, as well as a biographical piece from an 1872 issue of The Press of Somerset County, which notes that in addition to being in the lumber business, he spent a good part of his life in the newspaper printing business. My descent from Thomas Jefferson Copeland > Henry Clay Copeland > Lowell Copeland > Lowell Townsend Copeland > my mother > me.